No, this is not SPARTA but BETA. This means that if you download the software, please be prepared to supply feedback about its use. I specifically would like to know which mods on PP, besides EP1 mods, don’t work after isntalling them with MapTap. With this information we should be able to improve it. Feedback should be provided using the comments system on this post or direct email: planetphillip@gmail.com. Pleae provide as much information as possible. Emails or comemnts with “It crashed” will be ignored. What mod were you trying to install? What Operating system are you using? And any other information you can provide is needed. The automatic update mechanism has been disabled. This means that you will have to manually check when new versions are available. The chapter titles are not displaying correctly. The pop-up window telling you to open Steam to run mods is still popping up – ignore it. The “Open Review” page works intermittently for Source Mods. As with all versions of MapTap, it may not work as expected. You accept ALL risk involved. Of course, we don’t believe there will be any adverse affects, but it’s still not our fault if something goes wrong. MapTap posts use Dutch Master Paintings as a background. 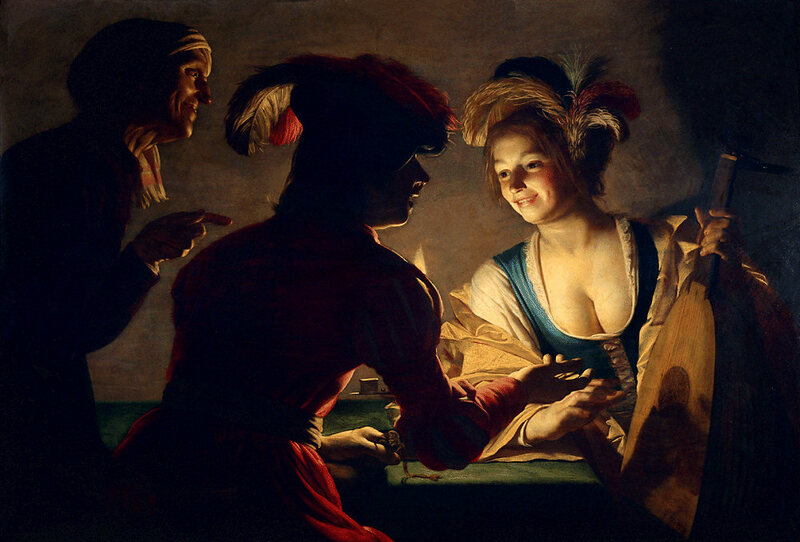 This painting is from Gerard van Honthorst called The Procuress or Matchmaker. You can see more of his work on gerrit-van-honthorst.org. Just FYI, the version number is still listed as 2.4.0-mod-support in the Help menu. Cool, I’ve never used map tap, but the steam pipe feature sound nice. I’ve been gamming for 31 yrs now and always installed maps/mods on my own, I have never used this “MapTap” but my map/mods collection, I’m sure rivals yours on this site! My question is since Steam messed up and my older mods won’t play now, this should/might help get things up and running?? I don’t like to edit the game files (.txt) every time I want to play!! 😉 BTW: I’ve noticed that my comment count does not advance, how come?? As has everybody. Until MapTap came along there was no automated way to do it. You should try it, you might be surprised at how easy it is to use. since Steam messed up and my older mods won’t play now, this should/might help get things up and running? In many cases YES. But not for Episode 1 mods or for all HL2 and Ep2 mods. Some issues can’t be fixed except by the modder and maybe not even then. Try it on a few older EP2 mods and let me know what happens. Just reporting, so far I’ve run more than 5 maps using this current version of Map Tap without any trouble. But my only suggestion is that when installing mappacks, the first map, that’s the map at the beginning of the mod, should be highlighted by some color just to know which map actually runs from the beginning the whole mod. You Know for example in “The Returning” HL1 mappack, the map specifically called “saj1” should be highlighted in color green or red for example, in order to not get confused and open another map, that run some other section of the mod but not the beginning one. Hi Phillip, I can’t install Maptap. I get this error…tried twice. Any ideas how to remedy this? Thanks! I fixed it. I used a program called Everything to find hidden Maptap files from an older install that I had uninstalled. I deleted those, then emptied the recycle bin. The set the install file to run as admin, and it worked! Now going to try installing the new mod you previewed today. MapTap installs a single Half-Life map or a mappack like a mod. The program creates map’s own directory in Half-Life folder and after press “Play”-button just starts Half-Life menu. Do I anything wrong? No, I don’t think you did anything wrong. Can you tell me more though? Which maps and mods did you try? Did some work but not others? Is your Steam installation a standard one? The more information you can supply, the more likely we are to be able to fix it. Thanks.